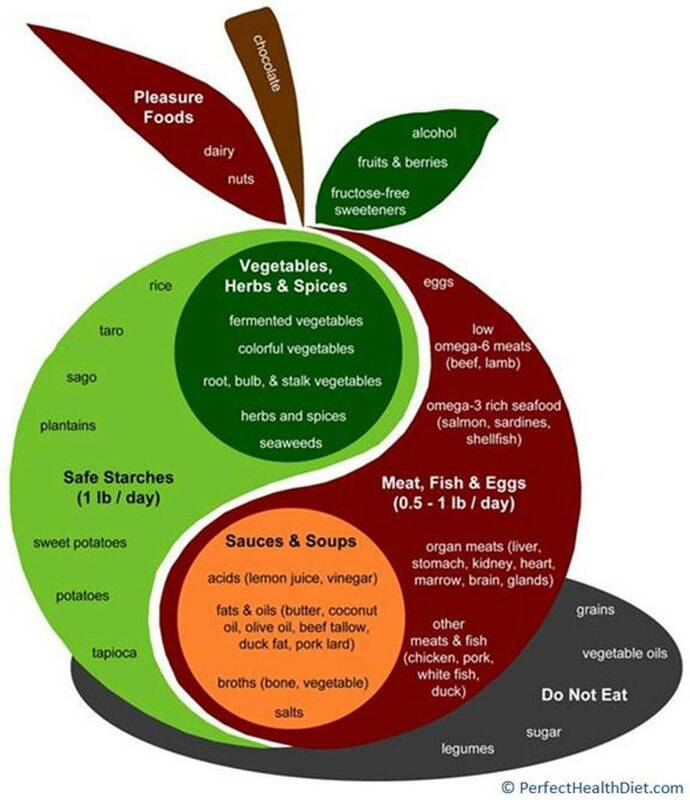 What to eat & what not to eat. First, determine your metabolic type. This determines how much protein, fat and carbohydrate will work best for your individual or ancestral metabolic type. Next, what foods are safest to eat? The graph above was created by Paul Jaminet Ph.D. Co-Author of Perfect Health Diet. This diet optimizes functional uses of protein, fat and carbohydrate, while avoiding the problematic foods that encourage metabolic imbalance and the development of infection. This dietary suggestion incorporates "safe starches," which are those that do not contain mycotoxins and/or substances that are anti-nutrient such as found in many grain foods. More information about this later on. Daily carbohydrate intake is estimated to be between 400 to 600 calories, primarily from starches (e.g., rice, potatoes, sweet potatoes, taro), fruits, and berries; with special exception for therapeutic ketogenic diets (which should have around 200 carbohydrate calories). However, your metabolic type should best determine how much focus should be on these starches. Vegetables are not included in the caloric count, there is no limit for these. Protein consumption should vary depending on your metabolic type. Recommended fats to consume are coconut oil, clarified butter, beef tallow, palm oil and lard. Oils that are okay to consume are olive oil and avocado oil, followed by nut butters. Carbohydrates to avoid are cereal grains, such as wheat, barley, oats and corn (In order of importance). This includes foods such as bread, pasta, breakfast cereals and oatmeal. Safe starches are white rice, (that includes rice noodles, rice crackers are okay). Avoid calorie-rich legumes, however peas and green beans are okay. Avoid unfermented soy products and peanuts. Consume quality is possible (grass-fed is best) liver, egg yolks, seaweeds, shellfish, vegetable and bone broths. Make sauces from an acid (lemon juice, vinegar), an oil, and herbs. Consume enough salt. Limiting sugar consumption is recommended as pathogenic bacteria are shielded from the immune system when large quanties are consumed. Foods pose potential risks to your hair - Any food that contains mycotoxins. Click here for more information on mycotoxins in food. The intake of Palm Oil and other tropical oils rich in Saturated fatty acids haved demonstrated to have the lowest androgen levels as well as the lowest 17beta-HSD activity when compared with the intake of a high Omega-6 Polyunsaturated fatty acid diet (rapeseed oil based), also known as Canola Oil had the highest androgen level and the highest 17beta-HSD activity. The entire context of the article explains rather well, how perceptions and beliefs--many of which are still held today have contributed towards a health epidemic world wide.